Chase Tone™ Golden Scripture Wah™ Wait List! 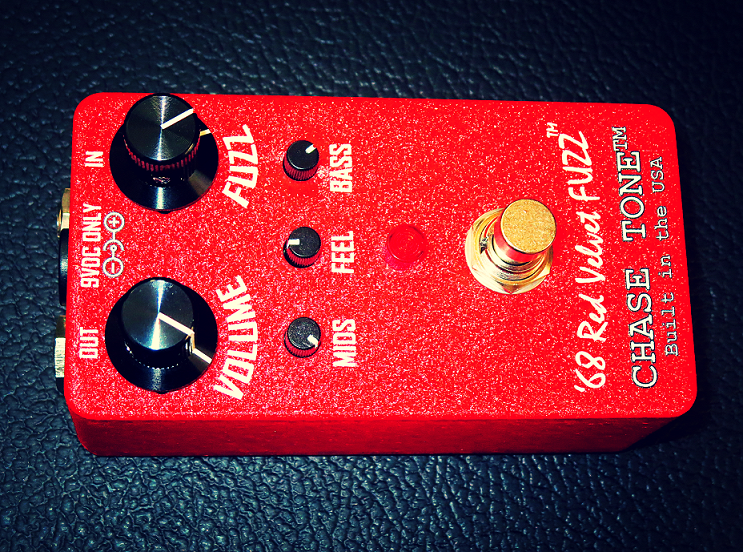 CHASE TONE™ ’68 Red Velvet FUZZ™ is BACK! Back-Order Due-to-Demand: Shipment within 3 to 4 business weeks from purchase date! It’s truly an honor to have one of my favorite players Sam Vilo on YouTube demo the CHASE TONE™ ’68 Red Velvet FUZZ™ and all of it’s harmonic complexity and touch response with the player’s attack and guitar settings ranging from crystal cleans hearing the wrap wire on the strings to smooth liquid overdrive and exploding 1960s Dallas Arbiter Fuzz Face germanium tones with a gain level that rivals any vintage Silicon DAFF. How cool?! Thank you, Sam Vilo! 30 Day Satisfaction Guarantee for USA Buyers. Absolutely Guaranteed. Shipments Back-Ordered @ 3-4 weeks or sooner! Matt Cummings. Fender Stratocaster. Fender Brown Face Amp. 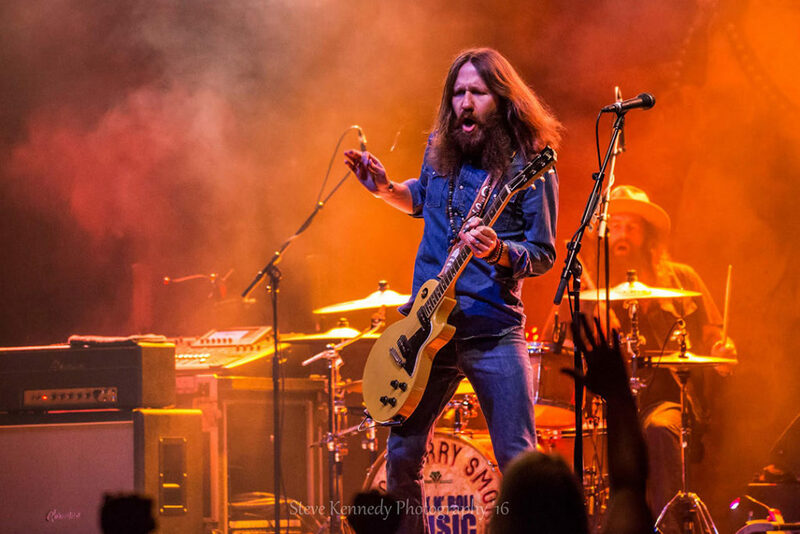 Dan & Mick @ That Pedal SHOW have a lot of fun playing the ’68 RVF™. ♫ Les Paul ♫ (Rock n Roll FUZZ tones)! Lastly, check out the ♪ 29:37 ♪ mark with all pedals ON. 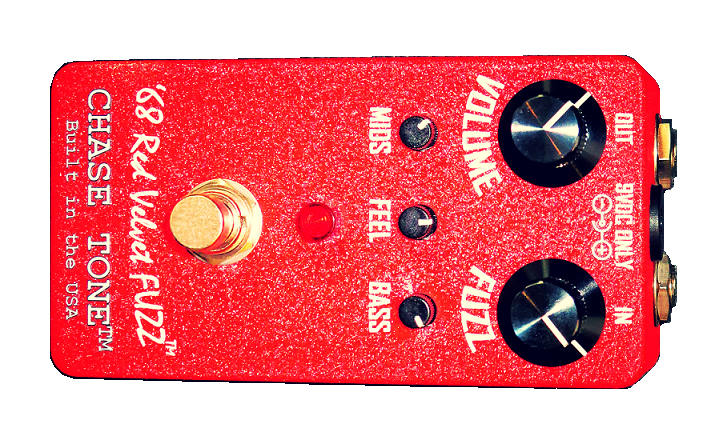 The ’68 RVF™ takes it into another Fuzz Galaxy! Lots of FUZZ TONE! Hi Kyle. I am very impressed with it. It cleans up very well when rolling back my guitar volume. I prefer germanium fuzzes usually, but the ’68 Red Velvet Fuzz is the first silicone fuzz face circuit that has impressed me. I found an ideal setting almost immediately. While I am waiting for your Hi Octave Fuzz to be available once again, I am making do with a Believe by Lovepedal and the ’68 Red Velvet Fuzz works very well with it. My main observation of silicone fuzz face circuits is that they are very dependent on amplifier output volume to maintain their brightness. I have concluded that I will be selling my other silicone fuzz now, and will no longer be tempted to order any others, so I thank you for helping me find the sound I had been searching for. Also your fuzz is very quiet in regards to extraneous noise. It responds very well to the late 60’s voiced pickups in my Strat, which means I am well pleased. That Strat and your fuzz take me straight to Axis Bold As Love/Electric Ladyland sonic scapes so I could not be happier. It also compliments my Vibe Machine II in a very musical way. I am also very pleased with the SECRET PREAMP™. 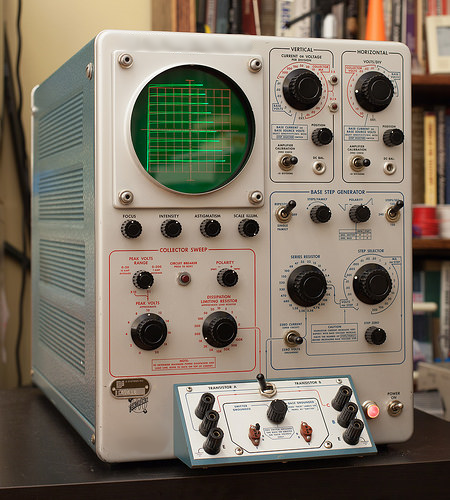 I use as recommended at the end of my signal chain. Primarily I use it to slightly sweeten/fatten my tone with the level set just slightly above unity gain with the bright setting. It is terrific with the Boonar, Supatrem, and the Vibe Machine. It also adds a wonderful texture to my Treble Booster and Tone Bender boxes. Like I said before I love fuzzes. They impart a texture I love especially with British voiced amps. 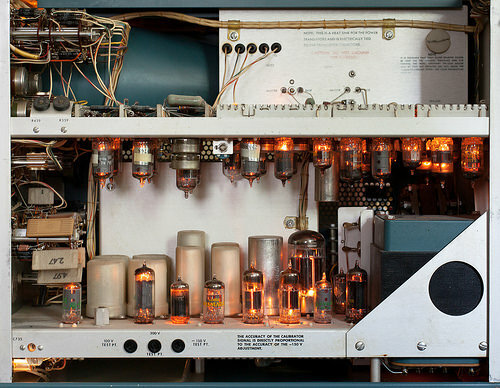 The SECRET PREAMP™ is performing a wonderful function of restoring my signal integrity. In conclusion, both the ’68 Red Velvet Fuzz and The Secret Preamp will be staying on my pedalboard. There will always be room there for more of your designs(Scripture Wah and HiOctave Fuzz). Thanks for everything. All the best, Dave. What sets the CHASE TONE™ ’68 Red Velvet FUZZ™ apart from the rest is its amazing feel and thick even order harmonic complexity. There’s no need to crank the amplifier or layer an overdrive or another fuzz but you can if you want to for more saturation and feedback. This may be the most harmonically complex and sweet feeling 60s Fuzz you’ll EVER play; sounding like you always thought a Fuzz Face should. This is really a hybrid (and more) of the best we’ve had to offer. Everything can be worked via the guitar volume knob: Pristine Cleans, Thick Sustaining Overdrive, All-Out Exploding Fuzz. The CHASE TONE™ ’68 Red Velvet FUZZ™ is a limited-edition, pedal-board-friendly version of our prized SOLD OUT CHASE TONE™ 1968 Dallas Arbiter BC183 Red Fuzz Face Replica that had it’s own authentic explosive fuzz tone like a wall of Marshalls. The durable powder-coat finish actually feels like VELVET and the fonts are accurately replicated from an original prized 1968 Dallas Arbiter Red Fuzz Face. SWEET! External mini-trim knobs allow the player to EQ fine-tune to their rig at home, in the studio, or on the road with a live band. Player preferred custom tweaks from our prized Red Stardust™ Germanium Fuzz and our Silver Stardust™ BC183/2L Silicon Fuzz, but this is something all new and an instant player favorite the world over. We cannot keep these in stock. All at an affordable price for players worldwide. Hey Kyle. Hope you are well. You’ve done it!! 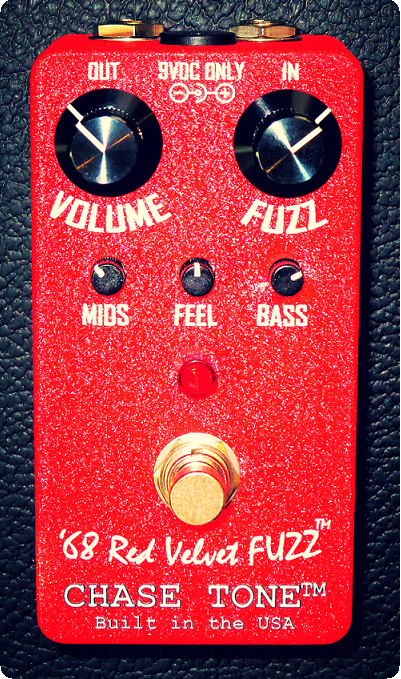 I never thought I’d ever find a Fuzz that could come close to the sensitivity and musicality of your Candy Apple Red Germanium Fuzz, but that ’68 Red Velvet FUZZ™ is hands down the best Fuzz I’ve ever played!! It sounds phenomenal mate, great job!! I had them all out over the last few days and here’s my thoughts….. The CAR is now my Sunday driver. I’ll bring it out, play it loud and really enjoy that Germanium sweetness when I want to just noodle around enjoy playing. The Roadster Fuzz is extremely versatile and can be tuned in and dialed up to work perfectly on my big board to react well with the other drive and modulation pedals as well as the buffer. But that ’68 Red Velvet FUZZ™ is just pure, thick, vintage filth. I love it!! 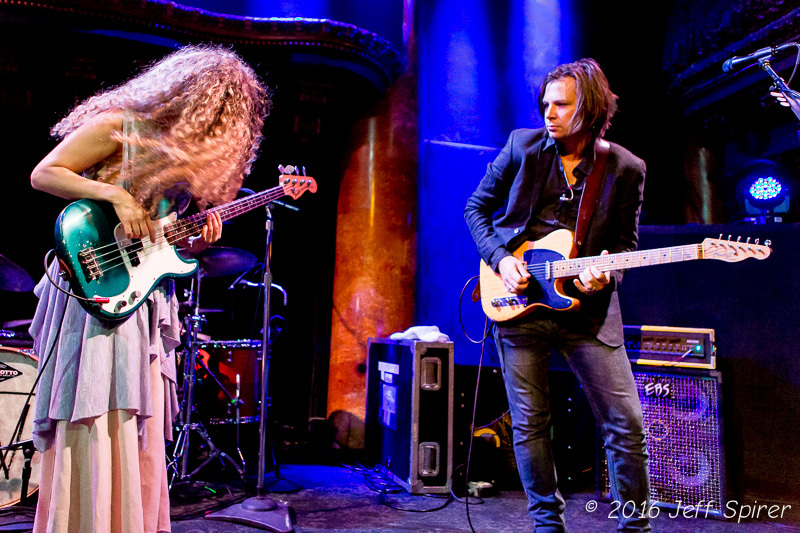 I’m going to put it on a second small board with the Signature Wah, an Octavia pedal, a Vibe and maybe a delay…. done!! Brad (Australia) PS: I’ll be buying a second one. VOLUME: Maximizing this control increases sustain, punch and treble bite. The sweet spot (1 o’clock through 4 o’clock) is adjusting it in comparison to your tube amplifier volume and EQ settings- An optimal setting is usually between Noon and maximum when turning in a clockwise direction. Greetings. I received the ’68 Red Velvet Fuzz a couple of days ago and I am totally blown away. It is exactly, and I mean exactly, as your description states. The interaction between the guitar volume knob and the RVF is incredible in itself. The sustain and harmonics (not to mention the fuzz tone ) are really mind blowing. Note definition is superb and to be honest, I have yet to find a setting that is not usable. I am running a Strat and Firebird into a Germino Masonette, and yes indeed, it does make the amp sound like “a million watts”. Amazing. I also have the Roadster Fuzz, which I love, but this is a totally different animal. Both are really good fuzz pedals and I have no problem with both of these on my board as they each offer their own unique tones. The 68 RVF is truly a remarkable pedal. I would have expected to pay much more for a quality build like this. You are knocking them out of the park! Thanks for all you are doing! Dave PS — loving the SECRET PREAMP™. Always on. Hello, I just wanted to drop a line to tell you I received my ’68 Red Velvet FUZZ™ today and it’s an amazing piece. Love the creamy tone, instant riff machine. Thanks again for an amazing and affordable piece of gear like this one. Best regards, Axel. Professional Low-Noise PCB DESIGN: FULL PCB GROUND PLANE provides enhanced noise reduction and rejection. Stable Performance On-the-Road- Temperature independent for consistent performance. Standard 9VDC Polarity Power- Center Negative (Standard) or 9Volt Battery. Vintage-Spec, New Production, Low Noise Carbon Film Resistors in 50+ year Aged ‘fine-tuned’ values. Retro Cherry Red Impact Resistant LED BEZEL with Wide Viewing Angle. ‘Sweet Red Velvet™ Powder Coat Finish (Zero Ozone Emissions and Ultra-Durable) with Vintage-Accurate Dallas Arbiter Fuzz Face DURABLE PRINT. High quality 1970s style aluminum enclosure:4” Long x 2.4” Wide x 1.5” High. Fits in the palm of your hand. Black Metal Replica TOP HAT KNOBS! Back-Order Due-to-Demand: Shipment within 3-4 business weeks from purchase date! Have a question or would like to be placed on the wait list for future payment? Please use the contact form below including your name and country and we’ll get back to you shortly!